MainStage Productions and 3 Knock-Out Cabaret/Concert Performances. As the longest continuously running Community Theatre in San Diego we have so much to be thankful for. The 2018 Season marks the last ever Blue Ribbon Awards ceremony, but do not be down-hearted, friends. We will continue to recognize, honor and celebrate our productions in the future with a celebratory party (just without the “judgy” part)! For this, our final awards ceremony, join us as we honor the 6 MainStage productions and revel in the fun and family we experience working together and doing what we do – making plays and making memories. Let’s reminisce together and recall the sold-out houses, the standing ovations, the love, the laughter and the tears! 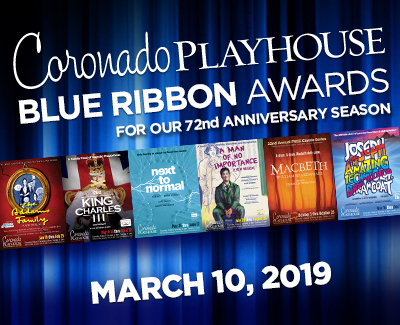 The Blue Ribbons recognize excellence on the Coronado Playhouse stage and honor the incredible work – bringing attention to the dedicated and talented actors, techs, designers, musicians, and production teams who contributed to making our the 2018 Season a massive success. Our 2018 MainStage Productions: The Addams Family, King Charles III, Next To Normal, A Man of No Importance, Macbeth and Joseph and the Amazing Technicolor Dreamcoat. $12 in advance / $15 at the theatre on Feb 18. If you purchase a table for 5 people @ $60, in advance, the table will be reserved. All individual general admission ticket sales are open seating. Everyone needs to purchase a ticket, including nominees and presenters. Your ticket includes: a welcome glass of champagne, fabulous appetizers, soda and coffee. There’ll also be entertainment, photos and a cash bar. Event has passed. Tickets no longer available for this event. Congratulations to everyone involved in our 2018 season.